If English is not your first language and you wish to attend an American university, then you need to plan to take the TOEFL iBT. 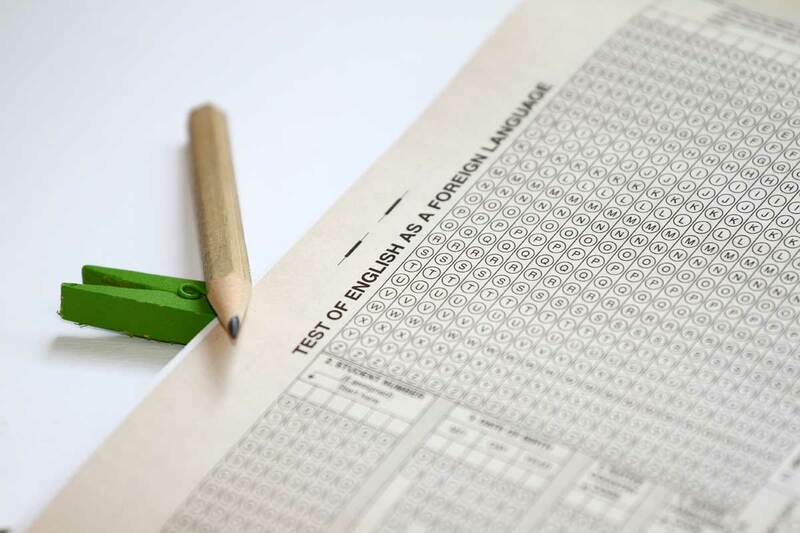 The TOEFL (Test of English as a Foreign Language) is an exam that measures an individual’s ability to use English, specifically at the university level. As such, the TOEFL iBT is the English-language test most preferred by universities in the United States, France, Germany, and by graduate programs in Canada. Learning English is an excellent way to improve your life. However, if you begin your English learning process with dread and a belief that it is impossible, it will make you miserable. Too many people start and stop learning English right away because they think it is too difficult. Typically, this is because people are focusing on textbooks and grammar rules. Spring brings DC back to life with warmer weather and beautiful blossoms. 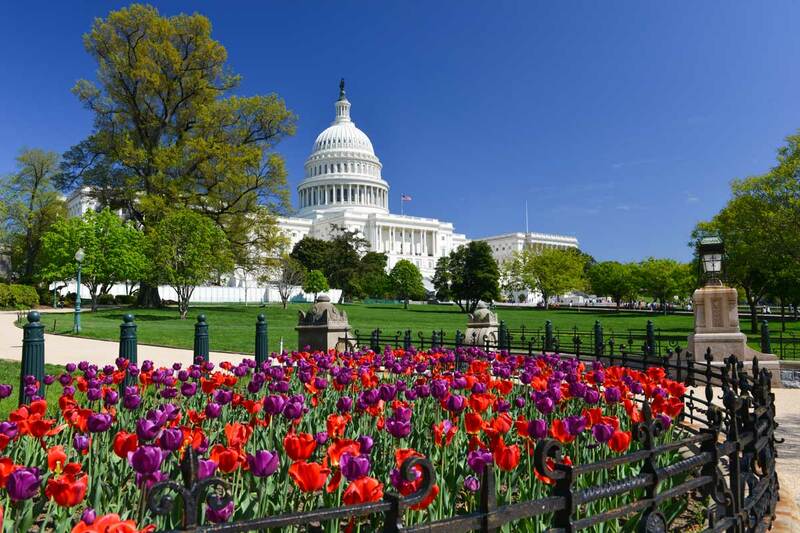 For students attending language schools in Washington DC, spring is a perfect time to explore DC and immerse yourself in the English language and American culture. Are you taking an English class in DC and looking for ways to boost your language learning outside of the classroom? If so, you’ve come to the right place. Today, we are talking about how popular TED Talks are exceptional supplemental learning tools for language learners. If you have never watched a TED Talk, you may be wondering what makes them so special. TED stands for “Technology, Entertainment and Design,” which began as a conference for leaders in 1984. 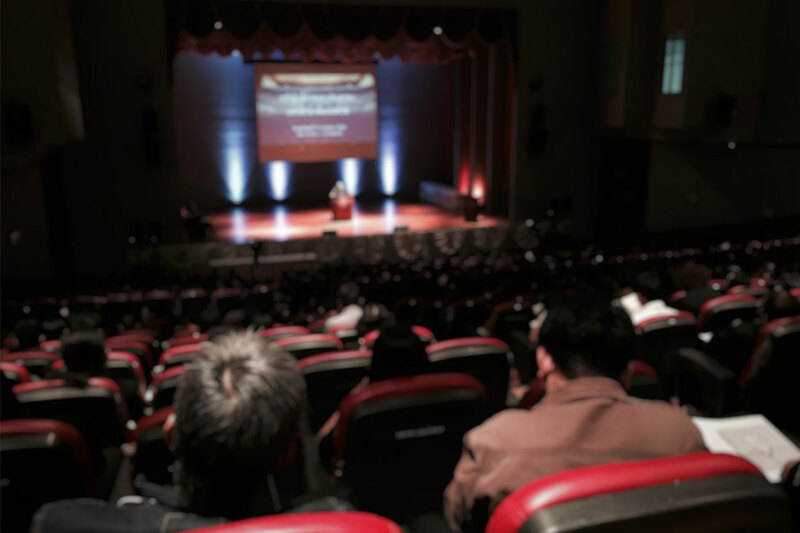 During this conference, leaders listened to powerful speeches on various topics in multiple languages. Beginning in 2006, these inspirational TED Talks have become available for free on the official TED website. Currently, there are over 3000 TED Talks available to watch on the website – the videos have been watched over one billion times. Today, it is easier than ever for students attending language schools in DC to participate in global learning via TED Talks. While everyone can gain something from viewing a TED Talk, there are several reasons why language learners will benefit. 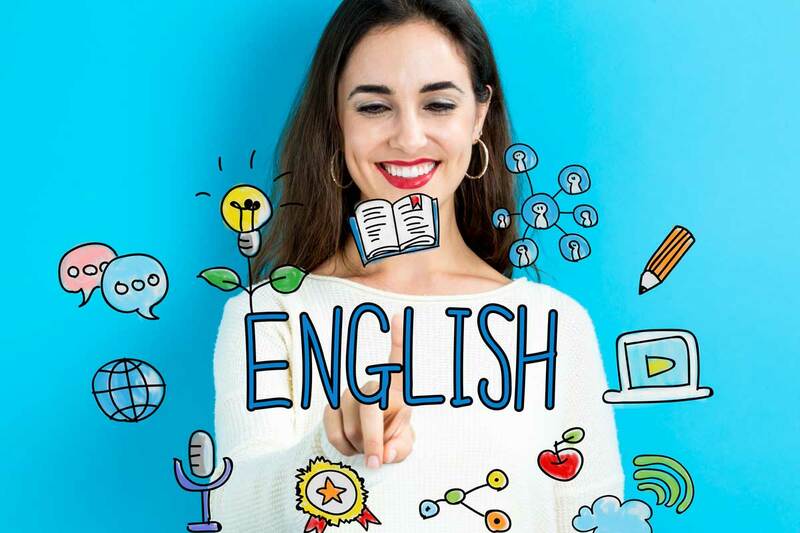 For example, students who are taking English courses in Washington DC are typically preparing to take an English exam or a future in an English-speaking career field. In order to communicate in English fluently, one must be able to listen, speak, read, and write in English. By viewing TED Talks, students can practice these necessary language skills. As they watch the videos, they are strengthening their English listening skills. As they use subtitles or print out transcripts, they are working on the English reading skills. For those heading to an English test center to take the TOEFL or the IELTS, viewing TED Talks is a study tool. Print out transcripts to use after you view the video. Do not rely too heavily on subtitles. Pay attention to tone and body language. Find opportunities to talk about what you learned from the TED Talk. We’ve compiled a list of ten of the most popular TED Talks for language learners. We encourage you to listen to them using the language learning techniques you have been practicing in your classes. 5 Techniques to Speak Any Language by Sid Efromovich – A positive speaker who speaks seven languages (a hyperpolyglot), Sid shares his tips for language learning. He will make you believe it is possible and give you practical tips. 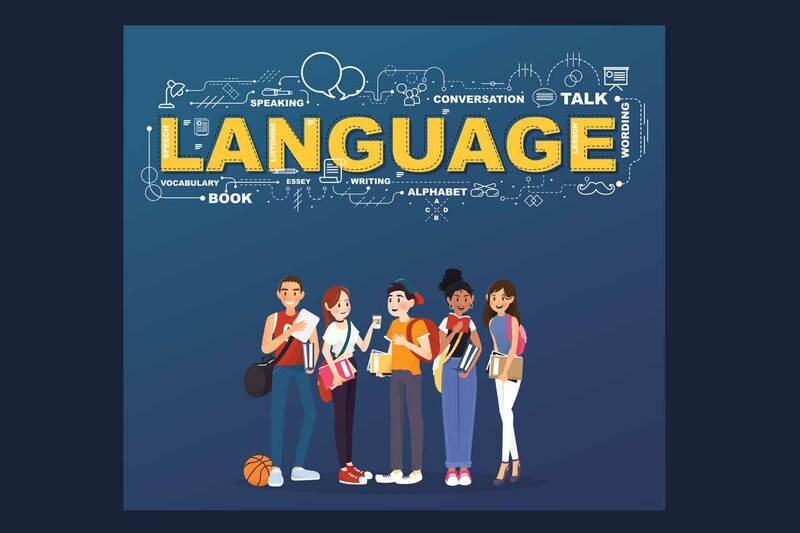 Breaking the Language Barrier by Tim Doner – One of the most popular TED Talks about language learning, this video includes a teen hyperpolyglot. He discusses his language learning journey and the various obstacles he has overcome. Go Ahead, Make Up New Words by Erin McKean – This is a short video that shows language learners how to have fun with language by sharing six different ways to make new words in English. How Language Transformed Humanity by Mark Pagel – This 20-minute video is delivered by a biologist. In his speech, Mark Pagel explains how language evolved as society grew. With tons of insight into the history of language and culture, you will walk away from the video feeling more knowledgeable. Metaphorically Speaking by James Geary – If you have ever been confused by a metaphor, this video is a must-watch. As language learners not only have to master a new vocabulary, they must also learn how to understand literary elements like the metaphor in this new language. One Simple Method to Learn Any Language by Scott Young & Vat Jaiswal – This is another motivational TED Talk for anyone hoping to learn another language. This particular video focuses on what they claim is their one simple solution – no speaking English. Rapid Language Hacking by Benny Lewis – This highly motivational speaker will inspire you to overcome challenges to learn a new language. After struggling with English and even receiving speech therapy, Benny overcame his language learning hurdles and now writes a popular blog under the same title as the video. The Benefits of a Bilingual Brain by Mia Nacamulli – If you need to remember why you are studying another language, this video will remind you of all the benefits. In this video, the speaker highlights the benefits of language learning for your brain beyond simply making travel easier. The Linguist Genius of Babies by Patricia Kuhl – Using brain scans and science, Patricia Kuhl explains how babies pick up one language over another. Through listening and cueing in the sounds they need to know, babies learn the language. Why I Keep Speaking Up, Even When People Mock My Accent by Safwat Saleem – This inspiring TED Talk will have you believing in the power of your dreams. The speaker grew up with a stutter; then as an adult, he was hurt when online commenters started making fun of his Pakistani accent. His story of overcoming his struggles and accepting his accent will leave a lasting impression. In addition to TED Talks that specifically address language learning, you can also boost your learning by viewing TED Talks on topics that are of interest to you. Some TED Talks are humorous; others are inspirational. Find TED Talks with content you will enjoy viewing. Plus, you can also follow language learning TED Talk playlists that include videos that are useful to language learners. These playlists often include TED Talks covering a variety of topics that are engaging, as well as TED Talks with speakers that are easy to understand. You can also search by the topic “language” to find several related TED Talks. If you found this article helpful, we’d love to talk with you about the Washington language school, inlingua. Contact us today for more information! If you are taking English courses in Washington DC during the spring, you are in for a treat. Spring in DC is beautiful. Everything comes back to life and the flowers bloom. Most recognizably, the cherry blossoms trees along the National Mall blossom, which is celebrated for four weeks each spring. In 1912, Tokyo Mayor Yukio Ozaki gifted America with 3,000 cherry blossom trees to represent the bonds between the two countries. As cherry blossoms are Japan’s national flower, this gift represented friendship. In 1915, America sent a gift of flowering Dogwood trees to Japan. Then, in 1934, the first Cherry Blossom Festival was held. It continues to be one of the most popular annual events in Washington DC. Japan originally sent cherry blossom trees in 1910, but the trees were infested with disease and bugs. Many first ladies have planted cherry blossom trees. There are two species of cherry blossom trees around the Tidal Basin in DC – the Yoshino variety and another species, the Kwanzan. More than 1.5 million people visit the National Cherry Blossom Festival. People often try to visit the festival at peak bloom time, which varies from year to year. Peak bloom refers to when 70 percent of the cherry blossom trees have bloomed around the Tidal Basin. Peak bloom occurs on April 4th on average. Cherry blossoms are known as “Sakura” in Japanese. The “Cherry Blossom Capital of the World” is actually Macon, Georgia. The cherry blossom trees may only flower for one week, which is one reason why this special time of year is celebrated in DC. For students attending language schools in Washington DC, here is the basic information you need to know about this year’s festival. It will take place from March 20th – April 14th, 2019. The cherry blossom trees are located all around the Tidal Basin. The closest Metro stop is the Smithsonian station. Then, it is just a short walk to the Tidal Basin. There are several events as part of the festival, most of which are free. Visit the National Park System’s website for the official peak bloom prediction. It is against the law to pick the cherry blossoms, so admire them, snap some pictures, but leave them alone! 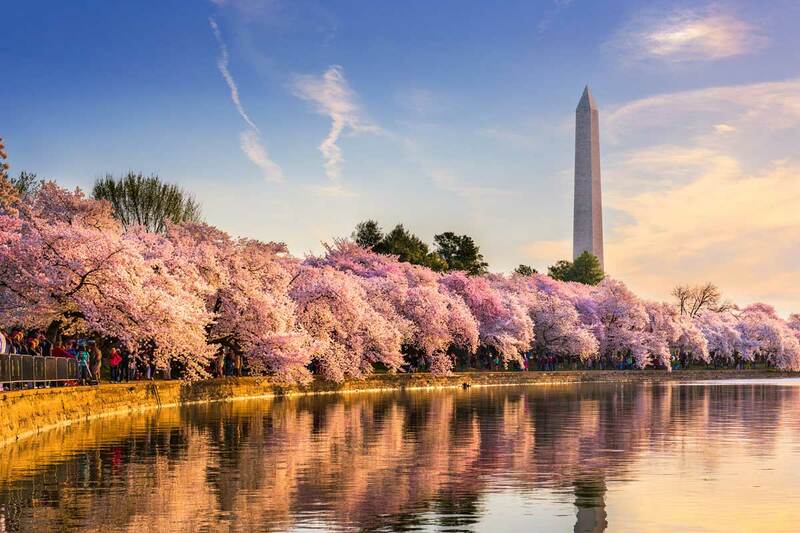 When you plan to visit the National Cherry Blossom Festival, there are several things you can do to make the experience enjoyable and memorable. First, plan to do a lot of walking. Avoid driving at all costs. Since the festival brings so many tourists to town, expect the streets to be much more crowded than usual. Make use of the Metro system or Capital Bikeshare. Wear comfortable shoes! You can also enjoy the festival by paddle boat in the Tidal Basin. This is a fun way to enjoy the spring weather and see the beautiful blooms. With a large number of visitors to the area for the National Cherry Blossom Festival, try to avoid the busiest times. Typically, the cherry blossom areas are less crowded early in the morning or in the evening. If you are living abroad to study English, then you should act like the tourist that you are. Take tons of pictures and share them with friends and family. Try to visit the festival as close to peak bloom as possible. Follow NPS’s bloom watch for an idea of when this will occur. If you follow these tips, we are sure you will find the perfect time and location to take as many Instagram-worthy shots as possible. Opening Ceremony – The National Cherry Blossom Opening Ceremony will be held on March 23rd at Warner Theatre. This year’s ceremony will include the cast members of “Pretty Guardian Sailor Moon” The Super Live and violinist Ikuko Kawai. While the event is free, you must reserve your tickets. Blossom Kite Festival – One of the most loved events of the festival is the Blossom Kite Festival, which will take place on March 30th on the Washington Monument grounds. You can fly your own kite or simply marvel at professional kite-flyers and stunt kite-flyers. Petalpalooza – Head to The Wharf on April 6th for a day-long extravaganza (between the hours of 12:00 pm and 8:30 pm). Petalpalooza includes games, activities, a beer garden, art installations, and concludes with an amazing firework show. National Cherry Blossom Festival Parade presented by Events DC – The most popular event of the festival is the annual parade, which signifies the conclusion of the weeks-long festival. This year’s parade will take place on April 13th. The 10-block parade includes giant helium balloons and musical performances. Sakura Matsuri Japanese Street Festival – This street festival taking place on Pennsylvania Avenue from 3rd to 7th Streets NW on April 13th is the largest Japanese street festival in the US. You can sample food, see art, and enjoy live performances. More than 80 groups will be represented. This is just one of the many fun things inlingua students get to enjoy as they study a new language in DC. Our students get to immerse themselves in American culture and experience all the excitement of living in the nation’s capital. Spring is a great time to visit DC and see the cherry blossoms bloom – it is an even better time to study a new language. Do you want to study English in Washington DC? Contact us for more information today! If you are like most students attending language schools in Washington DC, then you are glued to your cell phone (or mobile device). So why not make the most of your mobile device by finding ways for it to help you learn a new language? Therefore, it makes sense to use mobile devices to learn a new language. However, while there is an abundance of language learning apps, there are far more ways to use a mobile device for mobile learning. Mobile learning means students can learn a new language anywhere at any time. Today, let’s explore the various ways students who take English courses in Washington DC can benefit for mobile learning. Study after study has found a positive correlation between mobile devices and language learning. For instance, in Using Mobile Phones in Learning English: The Case of Jordan, researchers found that English language learning students report high usage for using mobile phones to learn English. Additionally, students reported having positive attitudes toward learning this way. Several other studies report similar findings. Ultimately, various studies suggest that students enjoy using their mobile devices, which makes it a great tool for supplemental language learning. For instance, while the best way to learn a language is to take courses, such as by attending one of the language schools in DC, students can also benefit from using their mobile devices to reinforce skills. As many of the unique features of mobile devices for language learning is overlooked, we are providing students with a broad overview of the various ways a mobile device can be used to supplement what you are learning in your English class in DC. There are countless language learning apps available for mobile devices. These apps range from game-based learning apps to language courses. Apps such as Duolingo and Memrise. You can see our favorite language learning apps in 12 Games and Apps to Supplement Language Learning. 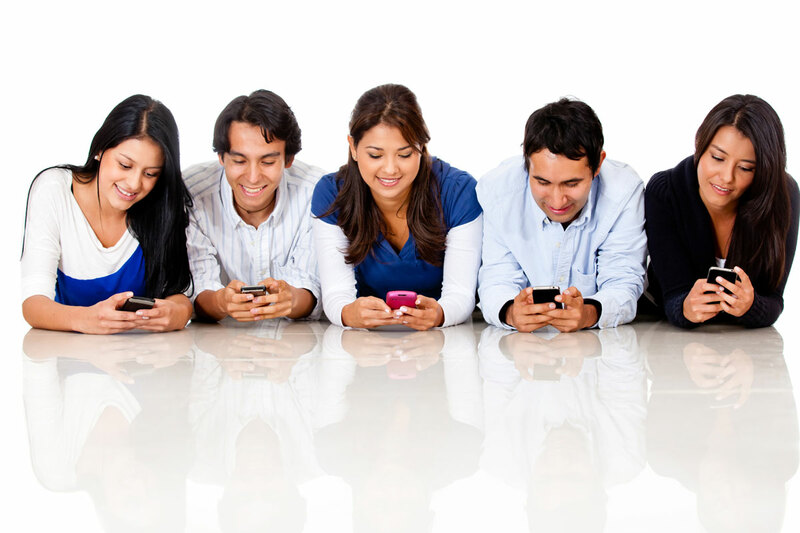 Mobile devices feature mobile messaging tools like text messaging. Mobile messaging is an excellent way to develop your English reading and writing skills as mobile messaging requires the user to communicate via the written word. Additionally, mobile messaging is a great way for students to learn how to use informal English. A major perk for language learning is social networking via sites and apps such as Facebook and Instagram. Language learners can connect with other language learners and native speakers globally. Plus, these social networks have other communication tools such as direct messaging and closed groups. As mobile devices have become more common for searching the web, we tend to forget they are phones designed for users to speak to one another. As a language learner, speaking in the language is critical. You can practice speaking to others via the phone or by using video chat tools such as Skype or Apple’s Facetime. Today’s mobile devices also allow users to download reading materials directly to their devices. Whether you opt to read a book or a newspaper in English, you can use your phone to practice reading in English. Another tip for using your phone to practice reading – change your phone’s language settings. Mobile devices come equipped with translation tools, such as Google translate and dictionary apps. While you do not want to rely on these tools for language learning, they are helpful when you are in need. For example, students who travel abroad to study English in Washington DC will find this mobile device tool helpful at the beginning of their studies. Most mobile devices include a voice recorder feature. If the device does not have this feature, you can download a voice recorder app. This tool is helpful for language learners as they can record conversations and listen back to learn pronunciation. Creative types are using their mobile devices to create content. For example, you can use your device to create videos, record music, or design graphics. 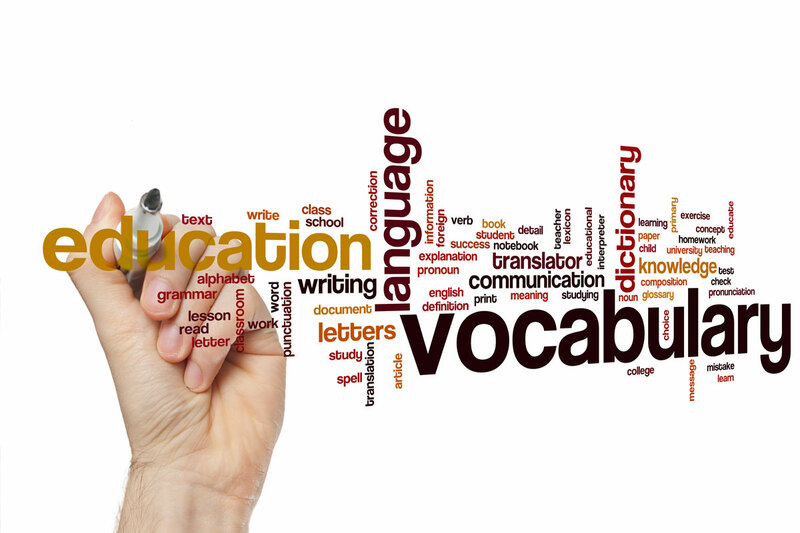 All of these creative tasks can also be used to help you learn new vocabulary. Visual learners can make use of their phone’s camera. By taking photos of objects and words, students are creating a visual language dictionary. For example, photos of street signs or restaurant menus will help give language learners something to refer to as they study. Mobile devices also include note-taking tools. Whenever you come across an unfamiliar word, you can take a note. Then, share the note with your language trainer and classmates at your next class. This is a great way to keep a running dictionary of new words. Students learning languages abroad can also blog directly from their mobile devices. In addition to full blogs via apps such as Blogger, language learners may enjoy trying to communicate via micro-blogging through Twitter. They can update those back home, as well connect with others. One of the most popular ways to use a mobile device is to use it to view videos. There are countless videos you can watch for free on sites such as YouTube, as well as streaming sites like Netflix. Watching videos is a fun way to practice your English listening skills. Are you already using your mobile device to learn a language? Boost your learning by taking an English class! Are you considering becoming an au pair in America? If so, move Washington DC to the top of your list. If you are a young adult hoping to experience US culture while providing childcare for a host family in the US, there is no better place than the capital of the United States. Social media is here to stay, so why not harness its power? Instagram is the popular picture-based social media app that has over 800 million users with 80% of those users living outside the United States. So, it comes as no surprise that people are using the visually stimulating app to connect with others worldwide. One of the major reasons for its widespread popularity is that it allows users to build connections with people across the globe – even those who speak different languages. Given the popularity and nature of the app, it is a fun way to learn a foreign language. We’re here today to help guide you through the basics of using Instagram to help you learn a foreign language. First, if you do not have an Instagram account, you must sign up for one. If you do already have an account, you can choose to begin your Instagram foreign language study with this account or create a new one to be used for language learning purposes. Next, do some basic research. You should look for language learning accounts connected with institutions. For instance, students who study English in Washington DC may follow @inlinguadc. Most schools will have a link to their Instagram pages on their websites. This type of research will point you in the right direction. But you should have some fun with Instagram, too. So, follow some of the most popular accounts with users who spoke the language you wish to learn. For example, look for celebrity accounts where the user posts frequently – especially if the user posts videos or Stories regularly. This is a great way to hear the language spoken in a natural way. Now, it is time to search for language learning accounts. For instance, if you simply search “Instagram learn English,” you will find numerous hits in the search engine with suggestions. Browse through the search engine results to find Instagram accounts that seem interesting. Ultimately, you want to look for accounts where the primary purpose is teaching a foreign language. The account should post regularly with images and words in the foreign language. Don’t worry! We’ll give you some accounts to help you get started. While society has moved past using “hashtag” as a slang term, it is still an effective way to find users on Instagram. Hashtags help searchers navigate the 800 million plus accounts on Instagram. Hashtags help you narrow down your searches, but without the right hashtags, you may still wind up with too many results as you search. Instead, you want to use hashtags correctly to help you find relevant content and connect with others. For instance, try the hashtag #languagelearning or specify the language #learnenglish. If you feel stuck, use sites like Hashtagify or Best Hashtags. A newer feature of Instagram is stories. Instagram Stories appears at the top of your Instagram feed. When you select stories, you will then be able to view videos and other content. These stories only last 24 hours, but they offer great opportunities to interact with other users. Stories are fun, but they are also another way for you to hear and see the foreign language. If you want to learn, don’t be a lurker. A lurker is someone on social media who just looks at the posts or images without interacting. Social media is designed for you to be social! This means you should go beyond “liking” a post to actually commenting and responding to comments other users’ leave on your posts. Plus, if you are trying to learn a new language, it gives you ample opportunity to practice. A major perk of using Instagram to connect with those who speak another language is the “See translation” feature. Individuals can not only adjust their own language settings, but they can also use the “See translation” feature to see translations for captions and comments in posts. For example, it is easy to use this feature when the native speaker uses vocabulary you do not understand. As we said earlier, we are providing you with a few Instagram handles to get you started. While they may not all be accounts for the language you hope to learn, these accounts will give you an idea of what language learning Instagram accounts look like. @frenchwords – An account with basic French including words, quotations, and images. @joyoflanguages – The Instagram account for a popular language blogger. @yourspanishguid – An official Spanish language learning Instagram hosted by a Spanish teacher. @russianwordsdaily – A flashcard-like Instagram page. @bbclearningenglish – An Instagram feed packed with useful posts for English language learners. @idiomland – An Instagram feed devoted to teaching and explaining English idioms. @1taskaday – A test-like Instagram feed for English language learning with multiple choice and fill in the blank prompts. 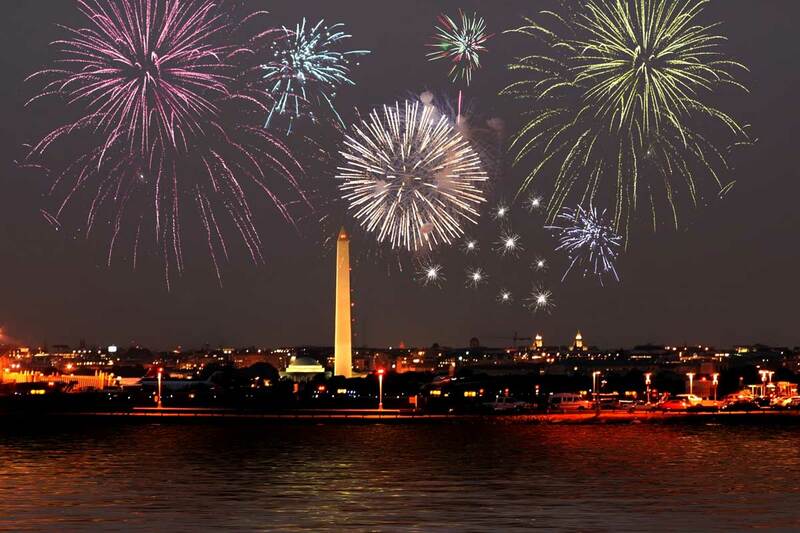 Learn English at inlingua Washington DC! Instagram is great! But, when it comes to learning a foreign language, you shouldn’t rely solely on Instagram. If you are serious about wanting to learn a foreign language, you should consider enrolling in one of the language schools in Washington DC. When students attend language school DC or choose to study English in Washington DC, they will be guided through the language learning experience while having fun at the same time. Rather than viewing Instagram stories and daydreaming about traveling abroad, students at the Washington language school inlingua actually are immersing themselves in another culture and experiencing life abroad. Instead of relying on following a popular Instagrammer, sign up for an English class in DC. Who knows? Maybe you’ll become the next Instagram language learner turned language teacher. Ready to Learn English in Washington DC? Contact inlingua today! New Year’s Eve is the perfect time to say goodbye to 2018 and welcome in 2019. For those students who are living overseas away from family to attend one of the language schools in DC, the ending of 2018 and the beginning of 2019 will be a special occasion. It will be a time when they can reflect on what they’ve learned so far in their studies, as well as immerse themselves in American New Year’s celebrations and traditions. Students who study English in Washington DC have an abundance of celebration options. It’s the start of a new year, which makes it the perfect time to step out of your comfort zone and try something. If you have ever wanted to learn a new language, now is a perfect time! Start the new year by strengthening your brain and becoming fluent in another language. Who knows? Maybe by 2020, you will even become a polyglot (a person who knows and is able to use several languages). So, you’ve resolved to learn English in 2019 – this is one of the best resolutions you can make! Good for you! Learning English will change your life for the better. 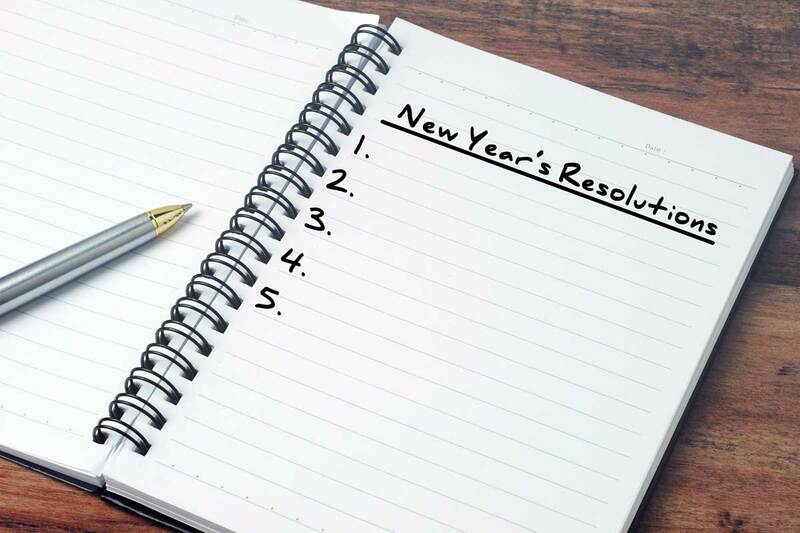 However, as anyone who has ever made a resolution can tell you if you don’t make plans to make your resolution come true, you are bound to fail.